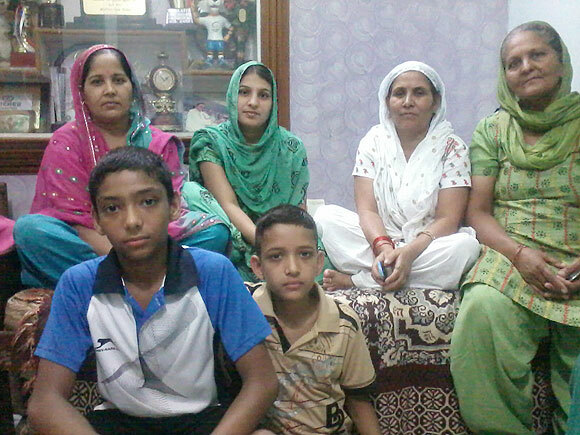 The excitement has been palpable as relatives, neighbours and friends of Olympic medal winner Sushil Kumar, who won Silver medal in the 66 kg men's freestyle wrestling on the final day at London Olympics. His parents, uncles and aunts, neighbours and friends gathered at his residence in Baprola, near Najafgarh on the outskirts of the capital. Sitting in a room adjacent, the ladies of the house speak of the early struggling years of the grappler. An aunt recalls the first time a young nine-year-old Sushil surprised people, and won his first bout ever. "There was a bet, and he (Sushil) beat his competitor -- he won 15 consecutive bouts -- and also won Rs 5 per bout," she laughs. Sushil studied at a local school at Baprola, and shifted to a higher school at Najafgarh when he entered class VI. 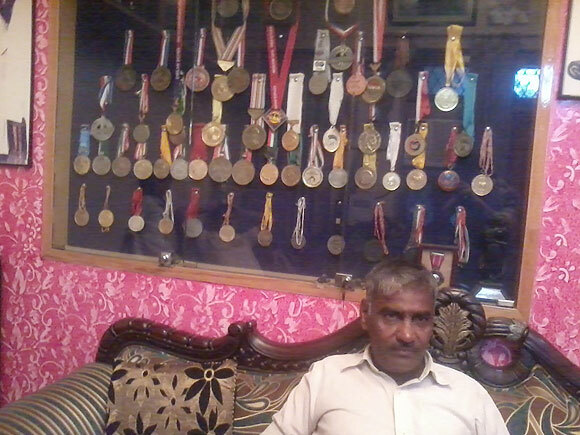 His fondness for wrestling started when he joined an akhada that was next to the school building. "As soon as the school bell would ring for PT classes, he used to run to the akhada," reminisces a relative. "After that, he was always to be found there." Sushil's earliest training in wrestling was either at this akhada besides his school, or at a small akhada close to his house. He started training formally when he was 12 years old at Chhatrasal Stadium. The family is well versed with the sport, for wrestling runs in the family. Sushil's grandfather, paternal uncles and father, all have had bouts at an akhada. In fact, the Olympic medal winner first started training with his cousin Sandeep Singh. His father Diwan Singh now recalls waking up early in the morning and ferrying milk and makhan every day for his son, who was training and living at the Chhatrasal stadium. "I made him eat makhan everyday first thing in the morning," he says, a proud father. The grapplers at the centre were put under a tight training schedule. Waking up at 5am daily, the wrestlers would undergo fitness training for five hours in the morning, part of which is repeated in the evening. The schedule would include running, push-ups, pull-ups and climbing on to a rope. The grapplers were also made to practice in the akhada for hours. Diwan Singh says that he kept an eye on Sushil all through his training years. "We had put everything we had into his training. I had to make sure that he was being well trained." "Everyday when I reached the training centre, my first job was to give the boys a good scolding. The coach also has to be strict to bring the boys in line," he explains. The boys at the akhada were trained till they were completely drained and left with no energy. Diwan revealed that he often scolded the boys when he found them resting after a hard days practice. Not only does the grappler work hard, his family has too had to put in with his struggle. None of the wrestlers at the training centres were allowed to use cell phones and were sent home only during holidays. "Sometimes, I didn't get to see him for months," exclaims Sushil Kumar's mother, Kamla Devi, who has never been to the training centre, and used to get to know about his well being only from the father. She also reveals that Sushil will be treated to his favourite coconut burfi and aloo ka parantha when he returns home. In the meanwhile, the boys trained hard at the training centre run by guru Satpal Singh. Says Santu, Sushil's friend from the training centre at Chhatrasal stadium, "He was always extremely good at wrestling. There is nobody in the entire country or in the Asian region who can beat him." 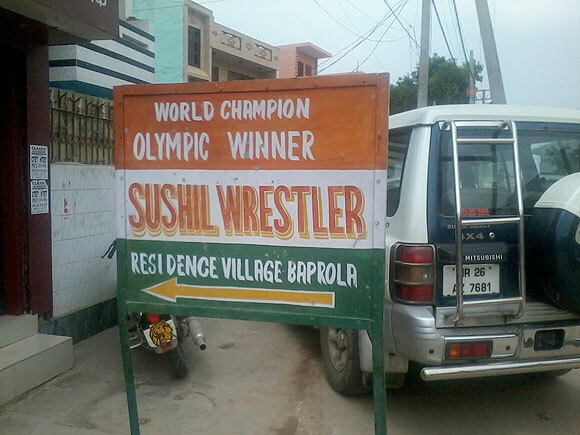 The family and the village of Baprola is now eagerly awaiting Sushil Kumar's return to his residence. "The whole village is going to the airport to meet him," says uncle Bijender. After his flight touches base in the country, Sushil will first visit the kuldevta, Dada den mandir in Palam after which he'll make a stop at the Sai Baba temple at Najafgarh and the Shiv Mandir in Baprola.